26315 Emerald Dove Dr Valencia CA has a wonderful central location not far from the Valencia Town Center and from the Golden State Freeway for easy freeway access – Homes for sale in this beautiful Valencia Summit neighborhood of Valencia CA in the city of Santa Clarita CA do not come up for sale very often. Low home owner association fees, mature trees and a collection of homes with mediterranean style features to cape cod and traditional are found in this neighborhood. This Plan 84 floor plan is in the Chelsea tract of The Summit homes and has a traditional/cape cod style exterior. 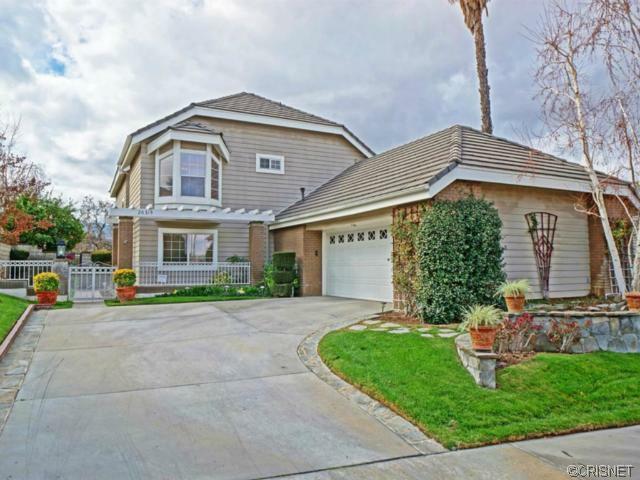 26315 Emerald Dove Dr Valencia CA – Home for Sale in Valencia Summit. This home at 26315 Emerald Dove Dr Valencia CA is also close to the College of the Canyons, and the California Institute of the Arts. It has great access to the 5 freeway and is close to the Valencia town center for entertainment and for dining out. Recreation includes the several recreation centers found in the neighborhood, plus tennis courts as well as miles of hiking or biking on the paseos which also link up to the Santa Clarita trail system. The local trail system runs through an 82 acre park in among old oak trees and grassland with views to the mountains and the city. Please reference the home you are asking the question about if it is about a particular home. We will return your email promptly. If you leave a phone number we will give you a call.